GLENDALE —Super Bowl security won’t be hard to spot next week. “There will be an officer on every corner,” said Lt. Charlie Consolian of the Phoenix Police Department. 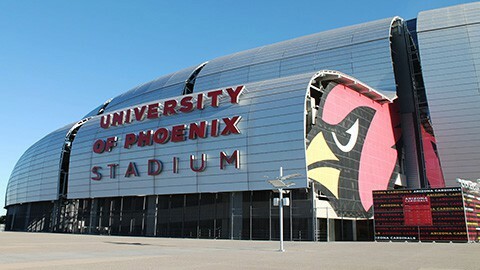 With downtown Phoenix hosting Super Bowl XLIX-related events throughout the week and Glendale hosting the game at University of Phoenix Stadium, Phoenix and Glendale police departments are planning to have “several hundred” officers on duty to protect spectators. Phoenix police will concentrate on the Verizon Super Bowl Central, a 12-block entertainment hub stretching from Central Avenue to the Phoenix Convention Center, which is expected to draw around a million people. Glendale Assistant Police Chief Matthew Lively will have less people to worry about — he estimates more than 100,000 people around the stadium on game day — but will be coordinating a level of event security far more advanced than a typical Arizona Cardinals game. Lively says the standard stadium perimeter, consisting of hard fencing or planters, is extended more than 300 feet. Super Bowl security measures also call for fans to pass through full magnetometers upon entry as opposed to the common hand-wand system used for other games. Violence has not been an issue at prior Super Bowls, said Lively, who supervised stadium security during Super Bowl XLII in 2008. But while fighting is less prevalent at the big game, acts of fraud become more of a concern. “For a Super Bowl or a bowl game, we’re looking at more issues with counterfeiting or fraudulent tickets or merchandise,” said Lively. The NFL will have a “Ticket Resolution” trailer on site that will pair NFL staff with Glendale detectives to solve any issues of fraudulent or even stolen tickets. The advances in barcode ticket scanning have helped prevent fraudulent entry over the years, so if fans buy tickets from a credible source like the NFL they will be protected if the tickets go missing. Numerous reports of counterfeit merchandise and tickets sold when Arizona last hosted the Super Bowl in 2008 should serve as a warning to those making unofficial purchases this time around. Lively expects to see a surplus of intoxicated persons, but will be leaning on the medical staffs and fire department to assist them. Consolian said Phoenix police will also be relying on the fire department to assist any medical emergencies at the downtown events. University of Phoenix Stadium will be heavily policed on Super Bowl Sunday.